My wife's cousin was cleaning out her shelves in her house and had a whole bunch of books she was going to give to a thrift store. She offered to me the chance to look through the box and pull any books I wanted before she took them away. I dug through and picked out an Asian Cookbook. So, we had her over for dinner and I cooked some things from it. My first thought was to do Indian, because I found some things in there I'd been wanting to try. One of them was Naan bread, and the other was Tandoori Chicken. But it turned out that we didn't have the right spices for the tandoori chicken, so I just followed the same procedure and recipe and used Garam masala spices instead of Tandoori masala. It definitely wasn't tandoori chicken, but it was good! I also got a bit closer to working out that "open oven" technique that I'd first tried with the jerk chicken. When I was making the Naan, I saw that the measurement for the flour was in grams and converted to pounds. I, unfortunately, don't have a scale, so I just mixed it in until it felt nice and smooth and right. So, the recipes today will reflect the way I actually did it, not so much what the book said. Since I cooked these things at the same time, I'll go over the instructions as I did them. There's a few suggestions I'll throw in that I hope to remember to do next time. My sister had told me a long time ago that indian spices need to be "activated" first, to really bring out their flavor. 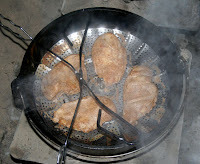 I forgot to that this time, so I'd get some coals under my little 8" and add the masala powder and a little olive oil. I'd cook that for a few minutes, then pull it off and add that to the yogurt. I took the chicken, thawed, and patted it dry. I cut a few slices into the chicken, so that the spices could more easily penetrate. I put it in a bowl with the yogurt and the spices and stirred it up. I set this aside for a couple of hours. 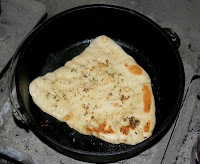 Then, I mixed the first set of ingredients in the Naan to activate the yeast. I let it sit until it got frothy, and then added the next set of ingredients. I mixed it all together (a little shy on the flour), then turned it out onto the floured tabletop to knead. As I kneaded it, I added more flour bit by bit until it felt right, smooth and satiny. Then I set aside the dough to rise. Then I went home teaching (that's a Mo' Church thing)! When I came back, the chicken and the bread were both almost ready. I lit up a lot of coals. Hey, it's cold out! The tandoori Chicken is normally cooked in a special oven that cooks with a very dry heat. So, the marinade gets baked onto the chicken dry. Dutch ovens, of course, trap the steam and hot moisture under a heavy cast iron lid. Also, if you just put the chicken in the bottom of the oven, the juices will gather around the chicken. So, I put the chicken in one of those folding steamers so the juices would drip down below, and put that into the dutch oven. The lid, I dealt with another way. I put that oven on the coals to begin cooking. I also oiled the other 12" dutch oven up and put it on and under the coals to pre-heat. Then, I cut the dough into quarters, and rolled and spread each quarter into a flat on the floured tabletop. I had mixed the butter and the spices, so I spread that over each flat. I put the flats into the dutch oven, one at a time. After about 3-5 minutes, I opened up the lid and turned the bread over for another 3-5 minutes. Then I pulled it out and put in the next one. In the meantime, the chicken is cooking. I put some more of the sauce/marinade on after a bit. After about 20 minutes on the heat, I figured the chicken was about half done. I had this set of tongs that I balanced across the rim of the dutch oven, and put the lid back on it. That lifted the lid enough to let the steam vent, but not so much that too much heat lost as well. I put some extra coals on the lid so that there was extra heat radiating from the top as well. After about another 20 minutes, the chicken was done and ready. In the meantime, I'd also made some rice with lemon juice. And it might not have been authentic Tandoori Chicken, but man, it was gooooood! So, a couple of sundays ago, our Bishop announced in Sacrament meeting that our ward is having a Chili cookoff for an activity! I'm pretty stoked. Half of me wants to try something completely new, another part of me wants to do my chili boats again. Do you guys know of any good chili secrets? Now that Christmas is over, I can write about one of the things I did. I got this idea that it would be cool to make some flavored olive oils and give them to some of my cookin' friends as Christmas gifts. I did a bit of research and found some cool flavor combinations, and I settled on three: Cinnamon and nutmeg, Italian seasonings, and Chili and onions. I had a very difficult time finding bottles for the whole adventure. I wanted the ones that have the little metal spouts. The ones I found had a hard time gripping once the bottle neck got oily. But I eventually discovered that once you've poured in the oil, if you dry of the inside of the neck really thoroughly with a paper towel, the rubber in the stoppers sticks again. So, I was good to go. I got the bottles at a dollar store, so I the biggest expense really was the oil. Those that got them for Christmas are probably reading this. I made three sets of the three oils, so that I could give one to John, of Mormon Foodie fame, one to my sister (who gave me the sourdough start I mentioned last time), and keep one for myself. I started off with the cinnamon one. I simply put about 2 teaspoons of nutmeg in the bottom of the bottle, and then dropped in a couple of sticks of cinnamon bark. Then I poured in the oil. Finally, I wiped dry the inside of the neck and put on the cap. It was that simple. For the italian style oil, I got some sprigs of fresh herbs (basil, thyme, and oregano), and then bruised them up a little bit. I'd read that allows for more infusion of flavor. I put them into the bottle. I sliced up a couple of cloves of fresh garlic for each bottle, and put in some dried tomatoes. Then those got filled up with oil, cleaned and capped. The chili one was also very easy to make. I'd bought some thin red chilis (dried) in the mexican section of the supermarket. I also sliced up some pearl onions and added those in. Then, in went the oil.